We have previously shown that the transcription factor FOXO1 is elevated in conditions with high levels of bone resorption. To investigate the role of FOXO1 in the formation of osteoclasts, we examined mice with lineage-specific deletion of FOXO1 in osteoclast precursors and by knockdown of FOXO1 with small interfering RNA. The receptor activator for NF-κB ligand (RANKL), a principal bone-resorbing factor, induced FOXO1 expression and nuclear localization 2 d after stimulation in bone marrow macrophages and RAW264.7 osteoclast precursors. RANKL-induced osteoclast formation and osteoclast activity was reduced in half in vivo and in vitro with lineage-specific FOXO1 deletion (LyzM.Cre+FOXO1L/L) compared with matched controls (LyzM.Cre−FOXO1L/L). Similar results were obtained by knockdown of FOXO1 in RAW264.7 cells. Moreover, FOXO1-mediated osteoclast formation was linked to regulation of NFATc1 nuclear localization and expression as well as a number of downstream factors, including dendritic cell–specific transmembrane protein, ATP6vod2, cathepsin K, and integrin αv. Lastly, FOXO1 deletion reduced M-CSF–induced RANK expression and migration of osteoclast precursors. In the present study, we provide evidence that FOXO1 plays a direct role in osteoclast formation by mediating the effect of RANKL on NFATc1 and several downstream effectors. This is likely to be significant because FOXO1 and RANKL are elevated in osteolytic conditions. Osteoclasts play a critical role in bone development, normal remodeling, and pathologic conditions such as periodontitis, rheumatoid arthritis, and osteoporosis. Osteoclasts are generated from myeloid progenitors that are produced in bone marrow and released into the vasculature (1). The formation of osteoclasts is governed by ligands, particularly M-CSF, receptor activator for NF-κB ligand (RANKL), and TNF-α as well as several other factors that directly or indirectly contribute to their formation and activity (2). Osteoclast formation involves several steps, including differentiation of myeloid precursors to preosteoclasts, fusion of mononuclear preosteoclasts to multinucleated osteoclasts, and maturation and activation of osteoclasts to resorbing bone. Several cytokines have been shown to play a key role in osteoclast formation. M-CSF stimulates progenitors to upregulate RANK expression, the receptor for RANKL (3, 4). RANKL signaling stimulates formation of single-cell TRAP+ osteoclast precursors and induces cell fusion to form multinucleated TRAP+ cells. M-CSF and RANKL stimulate several signaling intermediates and transcription factors such as DAP12, TRAF6, NF-κB components (relA, p50, p52), and potential downstream effector molecules needed for cell fusion, osteoclast activity, and survival, including CD9, dendritic cell–specific transmembrane protein (DC-STAMP), NFATc1, Atp6v0d2, OC-STAMP, integrin αvβ3, cathepsin K, and others (5, 6). Cell fusion is a characteristic feature of osteoclasts. It involves cell migration, chemotaxis, intercellular adhesion, and fusion of membranes. DC-STAMP, a transmembrane protein, plays an important role in cell fusion (7). It plays a central role in cell fusion and is induced by two transcription factors, NFATc1 and c-Fos (8). NFATc1 is involved in a number of cellular functions in various cell types. RANKL induces NFATc1 in osteoclast precursors through activation of NF-κB, which is further enhanced by Ca+ oscillation regulated by Tmem64 (9). Overexpression of NFATc1 can stimulate osteoclast differentiation without RANKL signaling, suggesting that NFATc1 is a master switch that regulates osteoclast differentiation downstream of RANKL (8). Once formed, osteoclasts are polarized so that the cellular constituents needed for resorption are localized to the bone surface. This process involves the formation of actin rings and the integrin αvβ3 (10). Resorption of the bone surface requires the action of vacuolar ATPase (Atp6v1c1) proton pump located in the osteoclast cell membrane and the release of cathepsin K, a lysosomal cysteine protease that degrades bone matrix proteins, including collagen (11, 12). FOXO1 is a transcription factor that has been linked to protection of osteoblasts from oxidative stress (13, 14). FOXO1 is a member of the forkhead transcription factors in the O-box subfamily. There are four members, FOXO-1, -3, -4, and -6 (15). FOXO1 regulates transcription of many different classes of genes depending on the cell type and nature of the stimulus (16). We have recently shown that FOXO1 mediates inflammatory gene expression in dendritic cells (17) and that FOXO1 is elevated in conditions with high levels of osteoclastogenesis (18, 19). Similarly FOXO1 mediates gene expression in macrophages (20). A recent report indicated that long-term combined deletion of FOXO1, -3, and -4 decreases physical bone mass by increasing osteoclast numbers and activity (21). Although that report examined the indirect effects of FOXO deletion associated with aging and focused on simultaneous deletion of three FOXO members in vivo, we took an alternative approach and examined the direct effect of FOXO1 in mediating short-term RANKL-stimulated osteoclastogenesis. The results indicate that FOXO1 is activated 2 d after RANKL stimulation in bone marrow macrophages (BMMs) and RAW264.7 cells. To determine whether FOXO1 mediates the effects of RANKL stimulation in vivo, a calvarial model was used (2, 6). FOXO1 deletion significantly reduced osteoclastogenesis and osteoclast activity stimulated by RANKL injection. In vitro experiments agreed well with in vivo experiments and demonstrated that FOXO1 deletion reduced osteoclastogenesis and osteoclast activity induced by RANKL in both BMMs derived from experimental mice and in RAW264.7 cells with FOXO1 knockdown by small interfering RNA (siRNA). Moreover, FOXO1 deletion reduced the expression of several proteins that are involved in osteoclast formation or function. These results point to FOXO1 having a role in mediating RANKL-stimulated osteoclast formation, which is distinct from its long-term effect associated with aging (21). Abs were obtained from Santa Cruz Biotechnology (Dallas, Texas) unless noted otherwise. Mice that express Cre recombinase under control of the lysozyme M promoter (LyzM+.Cre) were purchased from The Jackson Laboratory (Bar Harbor, ME). FOXO1L/L mice were provided by Dr. Ronald De Pinho (University of Texas MD Anderson Cancer Center, Houston, TX) (22). FOXO1L/L mice were bred with LyzM.Cre mice to generate experimental mice (LyzM.Cre+FOXO1L/L) and the control littermates (LyzM.Cre−FOXO1L/L) (17, 23). Homozygous LyzM.Cre mice were crossed with FOXO1L/L to generate mice that were heterozygous for FOXO1 conditional alleles (LyzM.Cre+FOXO1L/W) and then backcrossed with the FOXO1L/L mice to obtain the experimental LyzM.Cre+FOXO1L/L and the FOXO1L/L control littermates. Genotypes were determined by PCR using primers specific for LyzM.Cre (5′-ATCCGAAAAGAAAACGTTGA-3′ and 5′-ATCCAGGTTACGGATATAGT-3′) and specific for FOXO1 (5′-GCTTAGAGCAGAGATGTTCTCACATT-3′, 5′-CCAGAGTCTTTGTATCAG GCAAATAA-3′, and 5′-CAAGTCCATTAATTCAGCACATTG A-3′). We chose both male and female 10-wk-old mice for RANKL injection experiment. Anesthesia was achieved with ketamine (80 mg/kg of body weight) and xylazine (10 mg/kg) in sterile PBS. All procedures were approved by the Institutional Animal Care and Use Committee of the University of Pennsylvania. Soluble RANKL (3 μg/injection) (PeproTech, Rocky Hill, NJ) or vehicle (PBS) was injected at the midline of the calvaria of LyzM.Cre+FOXO1L/L and littermate control LyzM.Cre−FOXO1L/L mice daily for 5 consecutive days (24). One week after the final injection, mice were euthanized and calvarial bone was examined by μCT-40 (Scanco Medical, Bassersdorf, Switzerland). RANKL was injected at the midline between first and second coronal sutures and was compared with mice injected with vehicle alone, PBS groups. Specimens were fixed in paraformaldehyde, and small pits on the surface of the calvaria were quantified in reconstructed images following μCT scanning with NIS-Elements AR software (Nikon). Specimens were then decalcified in EDTA and osteoclasts were counted as TRAP+ multinucleated cells in sutures and bone marrow cavities by TRAP histostain (24) and immunofluorescence with Ab specific for TRAP. BMMs were cultured from bone marrow cells isolated from femurs and tibiae of experimental and control littermate mice (25). After the marrow was obtained, single-cell suspensions were prepared by mechanically dispersing the bone marrow through a 70-μm cell strainer. Then bone marrow cells were cultured in α-MEM supplemented with 10% FBS, 1% penicillin, and 0.05% streptomycin (Life Technologies, Grand Island, NY) at 37°C overnight. Then, nonadherent cells were harvested and transferred to media with 30 ng/ml M-CSF (PeproTech). Seventy-two hours later, floating cells were removed and attached BMMs were obtained. Spleens were harvested from experimental and control littermate mice (26), and single cells were obtained with a cell strainer (70 μm). Erythrocytes were removed by RBC lysis buffer (Sigma-Aldrich, St. Louis, MO) and splenocytes were cultured in DMEM supplemented with 10% FBS, 1% penicillin, and 0.05% streptomycin (Life Technologies) at 37°C overnight. The next day, nonadherent cells were harvested and used for immunofluorescence with Ab specific for FOXO1. RAW264.7 cells were cultured in complete DMEM supplemented with 10% FBS, 0.05% 2-ME, 1% penicillin, and streptomycin. In some experiments RAW264.7 cells were transfected with FOXO1 siRNA, FOXO3 siRNA, or control scrambled siRNA (Santa Cruz Biotechnology) with Lipofectin (Invitrogen, Carlsbad, CA) or GeneMute siRNA transfection reagents (Signagen Laboratories, Rockville, MD). In some experiments, freshly isolated single-cell suspensions of bone marrow cells were obtained from bone marrow and centrifuged at 500 rpm for 5 min in a cytocentrifuge (Thermo Scientific, Rockford, IL). Attached cells were fixed with 4% paraformaldehyde, washed, and subjected to immunofluorescence with Ab specific for FOXO1 or control IgG. No signal was detected with matched control. Results were obtained by measuring mean fluorescence intensity or counting immunopositive cells. BMMs were stimulated with 100 ng/ml RANKL and 30 ng/ml M-CSF or 100 ng/ml RANKL alone for 4 d and fixed with 4% paraformaldehyde, whereas RAW264.7 cells were stimulated with 100 ng/ml RANKL and then fixed with 4% paraformaldehyde. The number of multinucleated TRAP+ (more than three nuclei) cells, average area, and average number of nuclei per multinucleated TRAP+ cell were counted after staining for TRAP with a kit from Sigma-Aldrich or F-actin with FITC-labeled phalloidin from Sigma-Aldrich. Osteoclast bone resorption activity was measured with the OsteoLyse assay kit (Lonza, Allendale, NJ) according to the manufacturer’s protocol. Briefly, BMMs from experimental and control mice or RAW264.7 cells transfected with FOXO1 siRNA or control scrambled siRNA were cultured in 96-well OsteoLyse plates (Lonza) at 50,000 cells/well in complete α-MEM. BMMs were incubated with 30 ng/ml M-CSF and 100 ng/ml soluble RANKL, and RAW265.7 cells incubated with 100 ng/ml soluble RANKL. Four days later culture medium was renewed and samples were collected after an additional 24 h of culture, and calcium release was measured by fluorescence. RAW264.7 cells were stimulated with RANKL for 48 h. Inhibitors such as BML-257 (12.5 μM), triciribine (1 μM), SB203580 (10 μM), JNK inhibitor I (10 μM), PD098059 (20 μM), N-acetyl-l-cysteine (5mM), l-NG-nitroarginine-methylester (100 μM), sirtinol (10 μM), and DON (50 μM) were added for the last 24 h. Cells were then fixed in 100% methanol at −20°C for 10 min and incubated with primary Ab to FOXO1 or matched nonimmune primary Ab overnight at 4°C. Ab was then detected by a biotinylated secondary Ab and visualized using Alexa Fluor 546–conjugated streptavidin and counterstained with DAPI. Images were acquired using a Nikon 90i fluorescent microscope, and image analysis was performed using NIS-Elements software (Nikon, Melville, NY). Nuclear localization with standard immunofluorescence was confirmed with deconvolution immunofluorescent microscopy. Cells were imaged in five 1.7-μm stacks. The middle stack representing the center of the cell was then further analyzed for FOXO1 nuclear localization using NIS-Elements AR software (Nikon). Total RNA was extracted and quantitative real-time PCR was performed with primers designed using the Universal ProbeLibrary Assay Design Center (Roche Applied Science) and labeled probes (Roche Applied Science). Each value was normalized to ribosomal protein L32 and represents the mean of three independent experiments. Chemotaxis of BMMs and RAW264.7 cells was measured using transwells with polycarbonate filters (8-μm pores) (Corning, Corning, NY) with or without M-CSF added to the bottom chamber for 6 h at 37°C. Cells on the top of the filter were removed and those that had migrated to the bottom chamber were counted after DAPI staining by fluorescence microscopy. Cytoplasmic and nuclear extractions were prepared by using NE-PER nuclear and cytoplasmic extraction reagents (Thermo Scientific). The cytosolic and nuclear fractions were resolved by SDS-PAGE. Primary Ab against FOXO1 (Cell Signaling Technology, Boston, MA), laminin A (Sigma-Aldrich), and actin (Cell Signaling Technology) were used according to the manufacturers’ directions. Bands were visualized by biotinylated species-specific secondary Ab and chemiluminescence using a kit from Thermo Scientific. No signal was detected with matched control. For in vitro assays, cells were fixed in 100% methanol (10 min, −20°C) followed by incubation with primary Ab specific for FOXO1, CD11b, RANK, and the integrin αv or matched control Ab. Ab was then detected by a biotinylated secondary Ab and visualized using Alexa Fluor 546–conjugated streptavidin and counterstained with DAPI. Images were acquired using a Nikon 90i fluorescent microscope, and image analysis was performed using NIS-Elements software (Nikon). No signal was detected with matched control. For most assays data are presented as the mean fluorescence intensity for each group. In some experiments nuclear localization was determined by colocalization of FOXO1 immunostaining and DAPI nuclear staining. For in vivo assays, paraffin sections were subjected to Ag retrieval in citrate buffer at 95°C. Sections were incubated with Ab specific to TRAP, FOXO1, or NFATc1. Abs were localized with biotinylated secondary Ab followed by avidin–biotin HRP complex (Vector Laboratories, Burlingame, CA). Abs were visualized using streptavidin Alexa Fluor 546 (Invitrogen) for TRAP and fluorescein–avidin DCS (Vector Laboratories) for FOXO1 or NFATc1 and counterstained with DAPI. Tyramide signal amplification (PerkinElmer, Waltham, MA) was used to enhance the signal. Fluorescent immunostaining of TRAP+ and FOXO1+ or NFATc1+ cells were observed under ×20 magnification of images captured with a Nikon Eclipse 90i microscope (Nikon) and analyzed with NIS-Elements AR software (Nikon). RAW264.7 cells were transfected with FOXO1 WT, FOXO1 AAA construct or pcDNA empty vector alone, as we have described (27), by electroporation (Neon transfection system; Life Technologies) and cotransfected with an NFATc1–luciferase reporter (provided by Dr. Yihong Wan) (28). Luciferase activity was measured 2 d later using a Dual-Luciferase assay system (Promega) and reported as the firefly/Renilla luciferase ratio. Most in vitro experiments were carried out three times to obtain mean and SE from independent experiments. In some cases experiments were carried out in triplicate to provide a mean and SEM, with experiments having been performed three times to confirm results. In vivo experiments were carried out with five to seven animals per group. Statistical significance was determined by one-way ANOVA with a Tukey post hoc test for comparisons between multiple groups at the p < 0.05 level. In some cases, significance between experimental and control groups was directly compared at a given time point by a Student t test to establish significance at the p < 0.05 level. BMMs were isolated from experimental (LyzM.Cre+FOXO1L/L) and matched control (LyzM.Cre−FOXO1L/L) mice. LyzM-driven Cre recombinase reduced FOXO1 mRNA levels (Fig. 1A) by 95% and protein levels by 90% in BMMs (Fig. 1B). Most bone marrow cells and splenocytes directly isolated from experimental and control mice did not exhibit FOXO1 deletion as expected because most are not CD11c+ (Fig. 1C, 1D, Supplemental Fig. 1). LyzM deletes FOXO1 in BMMs. (A) FOXO1 mRNA levels were measured in BMMs by quantitative real-time PCR. (B) FOXO1 expression was measured by immunofluorescence as mean fluorescence intensity in BMMs. (C) Percentage FOXO1 immunopositive cells in single-cell suspension of bone marrow cells was measured by immunofluorescence. (D) FOXO1 expression was measured by immunofluorescence as mean fluorescence intensity in splenic cells. Each value represents the mean ± SEM of triplicate specimens. *p < 0.05 compared with matched Cre− group. Studies were carried out in which RANKL was injected over the calvarial bone of experimental and control mice. The formation of resorption pits was measured on the surface of calvarial bone in three-dimensional μCT images. The number of resorption pits decreased by 60% and total pit area was reduced by 64% in experimental mice compared with control mice (p < 0.05) (Fig. 2A–C). The number of osteoclasts was measured in the sutures and bone marrow cavities of calvarial bone by TRAP histostain (Fig. 2D, 2E) or by immunofluorescence with Ab to TRAP (Fig. 2F). RANKL stimulated a 3- to 10-fold increase in osteoclasts. 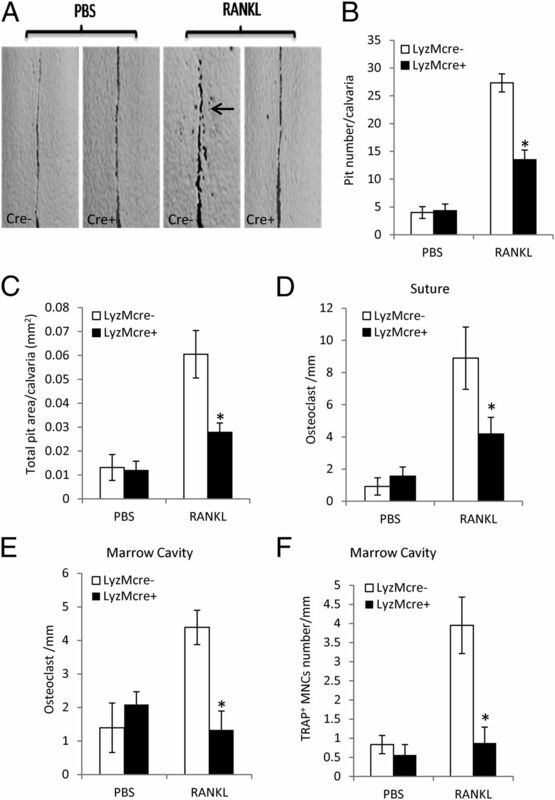 RANKL-induced osteoclast formation was reduced by 67% in sutures of LyzM.Cre+FOXO1L/L mice compared with control LyzM.Cre−FOXO1L/L mice (p < 0.05) and was completely blocked in bone marrow cavities (Fig. 2D–F). There was no difference in osteoclast numbers in PBS-injected groups (p > 0.05). The effect of FOXO1 deletion on cortical bone architecture and cancellous bone volume, mineral density, number, thickness, and spacing of trabeculae associated with remodeling in young mice was examined (Supplemental Fig. 2A–E). No significant difference was observed between experimental and control mice (p > 0.1). FOXO1 deletion reduces osteoclastogenesis in vivo. (A) Soluble RANKL (3 μg/injection) or vehicle (PBS) was injected at the midline of the calvaria of LyzM.Cre+FOXO1L/L and littermate control LyzM.Cre−FOXO1L/L mice daily for 5 consecutive days. After 12 d, calvarial bone was examined by μCT. (B and C) Pit number and total pit area per calvaria were analyzed with μCT. (D and E) TRAP+ multinucleated bone-lining osteoclasts were identified by histostain in calvarial sutures or bone marrow cavities. (F) Osteoclasts were counted as TRAP+ multinucleated cells lining bone in bone marrow cavity and detected by immunofluorescence. Each value is the mean ± SEM for n = 6 mice/group. *p < 0.05 compared with matched Cre− group. BMMs from FOXO1 deleted or matched control mice were stimulated with RANKL in vitro to induce osteoclastogenesis (Fig. 3A, Supplemental Fig. 2F). Deletion of FOXO1 resulted in a 65% reduction in the number of osteoclasts formed (p < 0.05) (Fig. 3B). Additionally, there was a 58% reduction in the average area per osteoclast and a 59% reduction in the average number of nuclei per osteoclast (p < 0.05) (Fig. 3C, 3D). Experiments were also carried out with RAW264.7 cells transfected with FOXO1 siRNA or scrambled siRNA followed by RANKL stimulation (Supplemental Fig. 2G). FOXO1 siRNA reduced FOXO1 levels by 70% (Fig. 3E) and reduced the number of osteoclasts induced by RANKL in RAW264.7 cells by 49%, the average area per osteoclast by 27%, and the average nuclei per osteoclast by 35% (p < 0.05) (Fig. 3F–H). Scrambled siRNA had no effect (p > 0.05). FOXO1 deletion or FOXO1 silencing reduces osteoclastogenesis and osteoclast activity in vitro. (A–D) BMMs from LyzM.Cre+FOXO1L/L and littermate control LyzM.Cre−FOXO1L/L mice were incubated with RANKL (100 ng/ml) and M-CSF (30 ng/ml). After 4 d cells were fixed and stained as indicated. (A) TRAP+ multinucleated osteoclasts (original magnification, ×10). (B) TRAP+ multinucleated osteoclasts with >30 nuclei per osteoclast. (C) Mean area per osteoclast. (D) Mean number of nuclei per osteoclast. (E–H) RAW264.7 cells were transfected with FOXO1 siRNA or scrambled siRNA and incubated with RANKL (100 ng/ml). After 4 d cells were fixed and stained as indicated. (E) FOXO1 mRNA levels were measured in RAW264.7 cells by quantitative real-time PCR after siRNA transfection. (F) TRAP+ multinucleated osteoclasts with more than three nuclei per osteoclast (original magnification, ×10). (G) Mean area per osteoclast. (H) Mean number of nuclei per osteoclast. Each value represents the mean ± SEM of three independent measurements. (I) BMMs from experimental and control mice were stimulated with RANKL (100 ng/ml) and M-CSF (30 ng/ml) or incubated with vehicle alone. Osteoclast activity was measured by release of europium-labeled collagen measured by florescence. (J) RAW264.7 cells were transfected with FOXO1 siRNA or scramble siRNA and were stimulated with RANKL (100 ng/ml) for 4 d. Osteoclast activity was measured as in (I). (K) RAW264.7 cells were transfected with siFOXO1, siFOXO3, or scrambled siRNA and then incubated with RANKL (100 ng/ml) for 4 d and fixed and stained for osteoclasts with TRAP histostain. (L) RAW264.7 cells were transfected with siFOXO3 or scrambled siRNA and FOXO3 mRNA levels were measured by quantitative real-time PCR after 2 d. Each value represents the mean ± SEM of three or four independent experiments. *p < 0.05 compared with matched Cre− or scrambled siRNA group, +p < 0.05 compared with matched Cre− or scrambled siRNA group stimulated with RANKL and M-CSF or RANKL alone. Osteoclast activity in vitro was measured by release of labeled collagen. RANKL stimulated a 16-fold increase in resorptive activity in osteoclasts from BMMs of control mice, which was blocked by FOXO1 deletion (p < 0.05) (Fig. 3I). FOXO1 knockdown by siRNA also blocked RANKL-induced resorptive activity from RAW264.7 cells (p < 0.05) (Fig. 3J). To compare the role of FOXO1 and FOXO3, each was knocked down separately in RAW264.7 cells and then stimulated with RANKL. FOXO1 knockdown reduced osteoclast formation by 66%, and FOXO3 knockdown had no significant impact on osteoclastogenesis even though FOXO3 siRNA effectively reduced FOXO3 levels (Fig. 3K, 3L). Both BMMs and RAW264.7 cells were examined for RANKL-induced FOXO1 by both quantitative real-time PCR and immunofluorescence (Fig. 4A–C). At the protein level little to no FOXO1 was detected in BMMs or RAW264.7 cells at baseline. RANKL stimulated an increase in FOXO1 levels that could be detected within 1 d and that increased further on days 2 and 4. RANKL stimulated a maximum 7.9-fold increase in FOXO1 in BMMs and a 4.5-fold increase in RAW264.7 cells (p < 0.05) (Fig. 4C–E). To confirm that FOXO1 expression was associated with osteoclastogenesis in vivo, double immunofluorescence was performed to identify FOXO1+, TRAP+ multinucleated osteoclastic cells (Fig. 4F). RANKL induces FOXO1 in BMMs and RAW264.7 cells. (A and B) BMMs from FOXOL/L mice were incubated with M-CSF (30 ng/ml) and RANKL (100 ng/ml) or RAW264.7 cells were incubated with RANKL (100 ng/ml). Cells were fixed 0, 1, 2, and 4 d later. FOXO1 (red) was examined by immunofluorescence with specific Ab, and cells were counterstained with DAPI (blue) (original magnification ×400 (A), ×200 (B). No signal was detected with matched control Ab (data not shown). (C) FOXO1 mRNA levels were measured by quantitative real-time PCR in BMMs following stimulation with M-CSF (30 ng/ml) and RANKL (100 ng/ml). (D and E) FOXO1 expression was measured by immunofluorescence as mean fluorescence intensity in BMMs and RAW264.7 cells. (F) RANKL was injected into the calvaria as described in Fig. 2. FOXO1+, TRAP+ double-immunopositive cells in close proximity to the bone surface were counted in the suture area (n = 6 mice/group). (A–E) Each value represents mean ± SEM of three independent measurements. *p < 0.05 compared with day 0 or with matched Cre− group. FOXO1 is active in the nucleus, and FOXO1 activation can be followed by nuclear localization. FOXO1 nuclear localization induced by RANKL could also be detected after 1 d and peaked with a 10-fold increase on day 2 in both BMMs and RAW264.7 cells by immunofluorescence (Fig. 5A, 5B). Interestingly, the pattern of FOXO1 nuclear localization differed from the expression pattern by declining substantially between days 2 and 4 with a 70% reduction in FOXO1 nuclear localization in BMMs and a 64% decline in RAW264.7 cells (p < 0.05) (Fig. 5A, 5B). Nuclear localization was confirmed by deconvolution immunofluorescent microscopy, which examined FOXO1 colocalization with DAPI at the center of each cell. By this analysis, RANKL stimulated a 7.4-fold increase in FOXO1 nuclear localization in BMMs from WT mice and a 5.6-fold increase in RAW264.7 cells (p < 0.05) (Fig. 5C, 5D), consistent with results obtained by standard immunofluorescence microscopy (Fig. 5A, 5B). RANKL-induced FOXO1 nuclear localization was also examined by Western blot analysis. FOXO1 protein accumulated in the cytoplasm within 4 h of RANKL stimulation (Fig. 5E). Nuclear localization was strongly detected 2 d after RANKL stimulation (Fig. 5E), which was consistent with the immunofluorescence data. RANKL stimulates FOXO1 nuclear localization. (A and B) BMMs were incubated with M-CSF (30 ng/ml) and RANKL (100 ng/ml) or RAW264.7 cells were incubated with RANKL (100 ng/ml) for 0–4 d. FOXO1 nuclear localization was determined by FOXO1 immunofluorescence and colocalization with DAPI nuclear stain. (C and D) Immunofluoresence was repeated and colocalization of FOXO1 and DAPI nuclear stain was determined by Z-stack analysis in the center plane of BMMs and RAW264.7 cells. (E) RAW264.7 cells were incubated with RANKL (100 ng/ml). Cells were fixed after 0, 4, and 48 h. Cytoplasmic and nuclear extracts were prepared, and FOXO1 cytoplasmic and nuclear levels were measured by immunoblot analysis. (F) RAW264.7 cells were stimulated with RANKL (100 ng/ml) for 48 h. Inhibitors of Akt, BML-257 (12.5 μM), triciribine (1 μM); p38, SB203580 (10 μM); JNK inhibitor I (10 μM); ERK, PD098059 (20 μM); ROS, N-acetyl-l-cysteine (5 mM); NOS, l-NG-nitroarginine-methylester (100 μM); sirtuin-1, sirtinol (10 μM); and phosphate-activated glutaminase, DON (50 μM) were added for the last 24 h. Cells were then fixed and FOXO1 was measured as described in (A). Each value represents mean ± SEM of three independent measurements. *p < 0.05 compared with BMMs on day 0 or with matched control group, +p < 0.05 compared with BMMs on day 2 after RANKL and M-CSF stimulation or with matched control group. To investigate RANKL-stimulated FOXO1 nuclear localization further, experiments were performed examining pathways that may mediate RANKL-induced FOXO1 nuclear localization. Inhibitors of p38 and JNK but not Erk MAPK inhibitors reduced FOXO1 nuclear localization by ∼50%. A reactive oxygen species (ROS) inhibitor, sirtuin-1 inhibitor, and NO synthase (NOS) inhibitor also reduced FOXO1 nuclear localization by 39–65% (p < 0.05) (Fig. 5F). Thus, a number of known pathways stimulated by RANKL induce FOXO1 nuclear localization. However, an Akt inhibitor did not have a significant effect on RANKL-induced FOXO1 nuclear localization. Several potential target genes were examined at the mRNA level to investigate the role of FOXO1 in mediating RANKL stimulation. This was done in BMMs obtained from experimental mice with FOXO1 deletion compared with matched controls. RANKL increased FOXO1 mRNA levels, which were blocked by Cre recombinase (Fig. 6A) (p < 0.05). Deletion of FOXO1 reduced by ∼60% the increase in NFATc1 mRNA levels stimulated by RANKL in vitro (Fig. 6B, 6C, Supplemental Fig. 3A) and reduced RANKL-stimulated NFATc1 nuclear localization by 53% (p < 0.05) (Fig. 6D). In vivo RANKL simulated a 2.1-fold increase in NFATc1+TRAP+ multinucleated cells measured by double immunofluorescence staining. This was reduced 70% in LyzM.Cre+FOXO1L/L mice compared with LyzM.Cre−FOXO1L/L mice (p < 0.05) (Fig. 6E). However, cotransfection of WT (FOXO1 WT) or a constitutively active FOXO1 (FOXO1 AAA) expression vector with an NFATc1 reporter did not enhance NFATc1 transcriptional activity compared with cotransfection with empty vector (PcDNS) (Fig. 6F). However, deletion of FOXO1 reduced the capacity of RANKL to stimulate increased mRNA levels of factors that are involved in osteoclast formation and activity including ATP6v0d2 by 49%, cathepsin K by 63%, and DC-STAMP by 55% (p < 0.05) (Fig. 6G–I). FOXO1 deletion inhibits expression of genes involved in osteoclastogenesis. 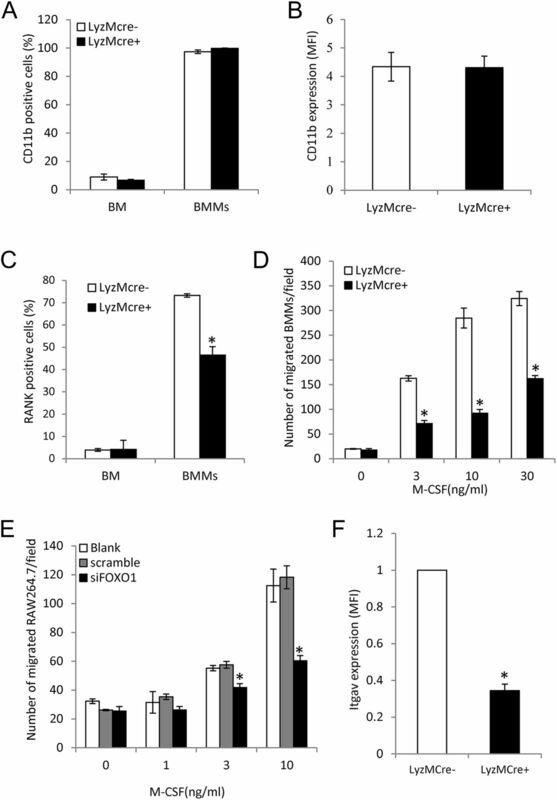 BMMs from LyzM.Cre+FOXO1L/L or littermate control LyzM.Cre−FOXO1L/L mice were stimulated with M-CSF (30 ng/ml) and RANKL (100 ng/ml) for 0 or 2 d. (A and B) FOXO1 or NFATc1 mRNA levels were assessed by real-time PCR. (C) NFATc1 was examined by immunofluorescence with Ab specific for NFATc1. Mean fluorescence intensity was measured. (D) NFATc1 was detected by immunofluorescence and nuclear colocalization with DAPI measured. (E) RANKL was applied to experimental and matched control mice described in Fig. 2. NFATc1 and TRAP were examined by double immunofluorescence, and sections were counterstained with DAPI. The percentage NFATc1+, TRAP+ double-immunopositive cells in close proximity to bone were measured in the calvarial sutures. (F) Luciferase assays were performed in RAW264.7 cells cotransfected with FOXO1 WT expression vector, FOXO1 AAA constitutively active or PcDNS empty vector alone, and an NFATc1 promoter–luciferase construct. Luciferase activity was measured as described in Materials and Methods. (G–I) mRNA levels of ATP6v0d2, cathepsin K, and DC-STAMP were measured in BMMs from LyzM.Cre+FOXO1L/L and littermate control LyzM.Cre−FOXO1L/L mice stimulated with M-CSF and RANKL as described in (A). Each value represents the mean ± SEM of three independent measurements. *p < 0.05 compared with matched control group. Osteoclast precursors (CD11b+ BMMs) are induced by M-CSF from myeloid progenitor cells (6). The effect of FOXO1 deletion on production of CD11b+ BMMs was examined in vitro by immunofluorescence. Neither the percentage CD11b+ bone marrow cells or the number of M-CSF–induced BMMs in vitro was affected by FOXO1 deletion, indicating that the effects of FOXO1 on osteoclastogenesis are downstream of BMM formation (p > 0.05) (Fig. 7A, 7B, Supplemental Fig. 4). RANK expression was examined in bone marrow cells and BMMs from LyzM.Cre+FOXO1L/L mice and matched control LyzM.Cre−FOXO1L/L mice following stimulation with M-CSF (Supplemental Fig. 3B). BMMs from FOXO1-deleted mice had an ∼40% reduction in RANK+ cells compared with BMMs from matched control mice (p < 0.05) (Fig. 7C). We also examined M-CSF stimulation of BMM migration (29, 30). M-CSF induced a dose-dependent 16-fold increase in BMM migration. This increase was reduced by up to 72% when FOXO1 was deleted (p < 0.05) (Fig. 7D). Similarly, FOXO1 knockdown in RAW264.7 cells reduced migration in these cells up to 56% (p < 0.05) (Fig. 7E). To determine how FOXO1 may affect BMM migration, integrin αv was examined in BMMs based on reports that it plays an important role in migration of these cells by immunofluorescence (31, 32). FOXO1 deletion resulted in a 73% decrease of integrin αv at the protein level (p < 0.05) (Fig. 7F). FOXO1 deletion or knockdown reduces M-CSF–induced RANK, integrin expression, and BMM migration. 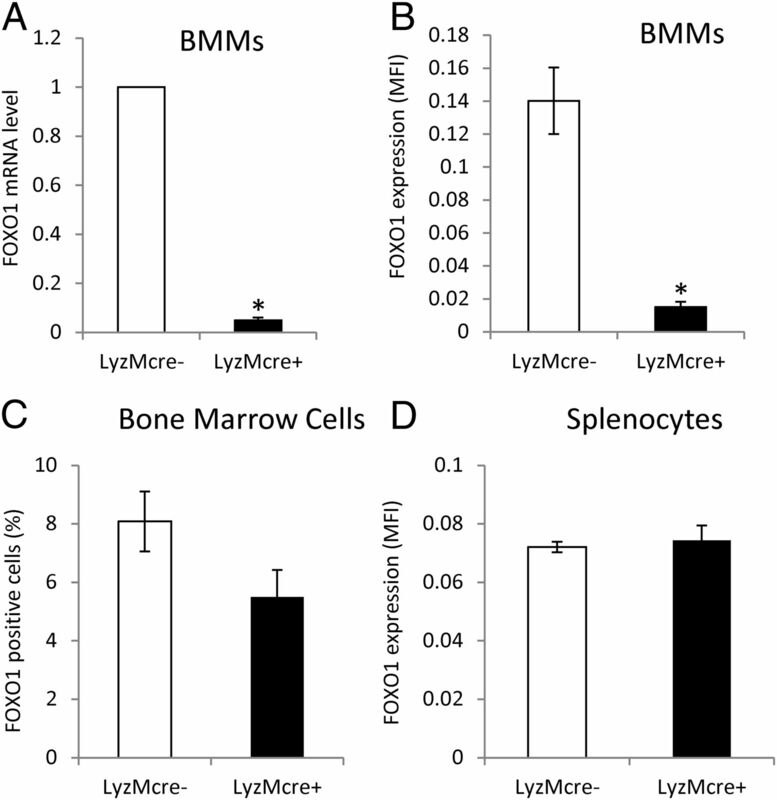 (A) Bone marrow cells and BMMs were prepared from LyzM.Cre+FOXO1L/L and littermate control LyzM.Cre−FOXO1L/L mice as described in Materials and Methods. The cells characterized as BMMs were determined by immunofluorescence with Ab specific for CD11b and DAPI counterstain. (B) CD11b expression was measured by immunofluorescence as mean fluorescence intensity. (C) Bone marrow cells and BMMs from LyzM.Cre+FOXO1L/L and littermate control LyzM.Cre−FOXO1L/L mice were fixed and RANK was visualized by immunofluorescence and DAPI counterstained. (D) BMM migration was measured in a transwell assay in response to M-CSF (0–30 ng/ml) placed in the lower chamber. (E) RAW264.7 cells were transfected with scrambled or FOXO1 siRNA and cell migration was measured in response to M-CSF (0–30 ng/ml) placed in the lower chamber. (F) The protein level of the integrin αv was measured in BMMs from LyzM.Cre+FOXO1L/L or littermate control LyzM.Cre−FOXO1L/L mice by immunofluorescence with specific Ab and the results are expressed as mean fluorescence intensity. Each value represents the mean ± SEM of three independent measurements. *p < 0.05 compared with matched Cre− or matched control group. The role of FOXO1 in regulating monocytic cells has received relatively little attention. FOXO1 has been shown to modulate TLR expression and cytokine production in monocytes and dendritic cells, which share a common precursor with osteoclasts (17, 20). In the present study, we report that FOXO1 has an important role in mediating induced osteoclastogenesis. RANKL stimulated FOXO1 expression and FOXO1 nuclear localization in vivo and in vitro. FOXO1 deletion or knockdown reduced RANKL-stimulated osteoclast formation in vivo and reduced osteoclast formation from BMMs and RAW264.7 cells in vitro. Additionally, FOXO1 deletion in myeloid cells reduced M-CSF–induced RANK expression and migration of BMMs. However, FOXO1 deletion did not affect formation of BMMs in vivo or in vitro. To investigate the role of FOXO1 on RANKL-stimulated osteoclastogenesis, mice that expressed lysozyme M promoter-driven Cre recombinase (33) were bred with floxed FOXO1 mice (34). This led to substantial deletion of FOXO1 in osteoclast precursor cells, BMMs. BMMs from experimental mice had a 95% reduction of FOXO1 mRNA and 90% reduction of FOXO1 at the protein level compared with control mice. This was not a general reduction of FOXO1 in hematopoietic cells because there was no significant difference in FOXO1 levels in bone marrow cells or splenocytes from experimental and control mice. Several lines of evidence establish that RANKL stimulates FOXO1 in osteoclast precursors. RANKL induced a time-dependent increase in FOXO1 mRNA and protein expression in both BMMs and the osteoclast precursor cell line, RAW264.7, which increased 5- to 8-fold after stimulation. In vivo RANKL stimulated an increase in FOXO1 in osteoclasts as determined by the number of FOXO1+TRAP+ double-positive multinucleated cells. Interestingly, RANKL also stimulated an increase in FOXO1 nuclear localization, which peaked at day 2 and declined on day 4, although expression was still high on day 4. This pattern was observed in both BMMs and RAW264.7 cells. FOXO1 nuclear localization 2 d after RANKL stimulation was shown by both immunofluorescence and Western blot assays. Each of these assays was carried out with primary Abs to FOXO1 from different sources and gave consistent results. The time frame for induction of FOXO1 nuclear localization by RANKL is considerably slower than the 1–2 h induction that is observed for TNF stimulation. However, it is similar to the time frame of RANKL-induced NFATc1 (8). 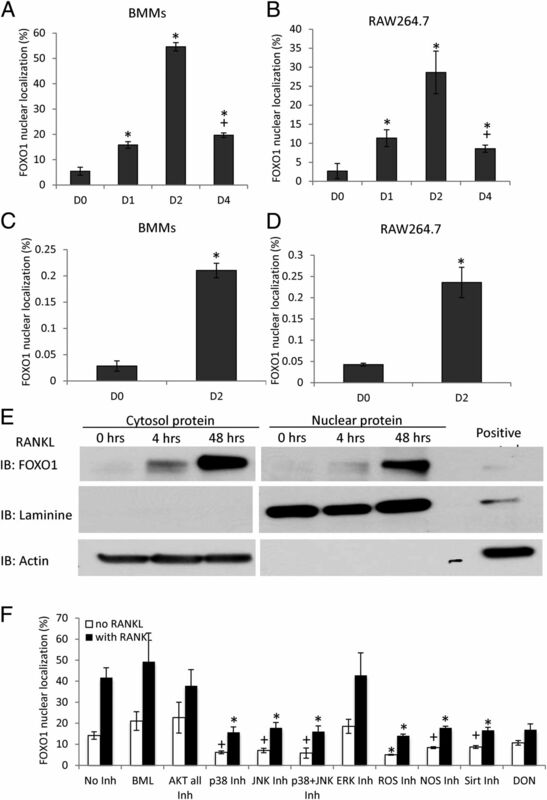 Interestingly, both the protein expression and nuclear localization of NFATc1 are continuously increased during RANKL-induced differentiation of BMMs to osteoclasts. Because FOXO1 activity is directly related to its nuclear localization, the functional significance of high FOXO1 expression but exclusion from the nucleus on day 4 requires further investigation. Pathways that are known to mediate RANKL-induced NFATc1 also were shown to be involved in FOXO1 nuclear localization (35–38). Thus, FOXO1 nuclear localization was significantly reduced by inhibitors of MAPK, ROS, NOS, and deacetylase. In contrast, Akt, which is known to negatively regulate FOXO1, did not have a significant effect on RANKL-induced FOXO1 nuclear localization 2 d after stimulation. That FOXO1 had a significant effect in mediating RANKL stimulation was shown by significantly reduced osteoclast formation in vivo and reduced total resorption pit area in experimental mice compared with matched control mice. 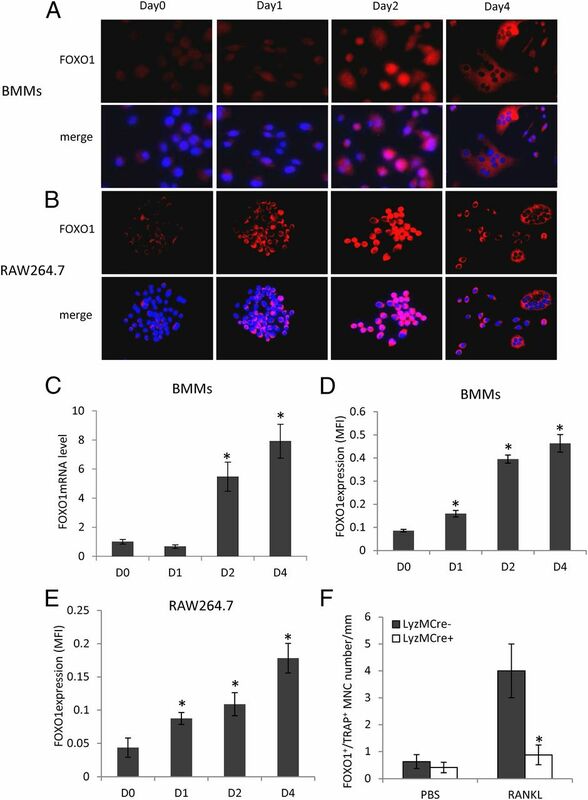 The effect of FOXO1 deletion on reducing RANKL-stimulated osteoclast formation from BMMs or RAW264.7 cells in vitro was similar to in vivo results. Additionally, the size and number of nuclei per osteoclast was significantly smaller when FOXO1 was deleted or silenced, suggesting that the amount of cell fusion was diminished. Osteoclast resorbing activity was also reduced when FOXO1 was deleted in BMMs or silenced in RAW264.7 cells in vitro. We also compared cancellous bone volume and several aspects of bone architecture in vertebrae of LyzM.Cre+FOXO1L/L mice versus control littermates. However, there was no significant difference between the two groups, suggesting that FOXO1 deletion alone does not have a major impact in physiologic bone remodeling in young mice. Several downstream targets were identified to investigate mechanisms through which FOXO1 may affect osteoclastogenesis. These studies investigated whether FOXO1 mediated the expression of gene targets that are induced by RANKL stimulation (1, 39). NFATc1, ATP6v0d2, and DC-STAMP expression and nuclear localization of NFATc1 were reduced by FOXO1 deletion. NFATc1 is a master regulator of osteoclastogenesis, transducing the effects of RANKL-induced fusion of precursor cells (1, 39). Thus, FOXO1 may impact cell fusion through downstream regulation of NFATc1, which in turn regulates DC-STAMP and ATP6v0d2 (7). FOXO1 also modulated mRNA levels of genes that are needed for osteoclast function, including cathepsin K and ATP6v0d2, which are responsible for dissolution of the mineral phase and proteolytic degradation of bone matrix proteins (6). The latter are consistent with our findings that FOXO1 deletion or knockdown reduced osteoclast activity stimulated by RANKL in vitro. Moreover, the linkage between NFATc1 and FOXO1 is supported by in vivo results that FOXO1 deletion reduces NFATc1 expression in osteoclasts following RANKL injection. However, a luciferase reporter assay suggests that NFATc1 promoter activity is not directly regulated by FOXO1, which may indicate that other mechanisms are involved. FOXO1 deletion did not affect the formation of osteoclast precursors but did affect M-CSF–induced BMM migration and M-CSF–induced integrin and RANK expression. RANK, integrin αv, and BMM migration are important in the formation of osteoclasts from BMM osteoclast precursors (31, 32). Thus, FOXO1 may also influence the formation of osteoclasts by mediating M-CSF stimulation of BMMs. Bartell et al. (21) reported that RANKL reduced FOXO1 promoter activity at 16 h in vitro and that simultaneous FOXO1, -3, and -4 deletion in vivo increased osteoclastogenesis and bone resorption. Their report concluded that FOXO1, -3, and 4 acted to inhibit bone loss by inducing catalase production, which acted to reduce formation of H2O2. In contrast, we focused on FOXO1 alone and downstream events that occur in a later time frame, 2 d after stimulation when osteoclast precursors fuse to form multinucleated cells. Our results demonstrate that FOXO1 mediates several events associated with RANKL-induced osteoclastogenesis in vivo and in vitro and also affects events downstream of M-CSF, including RANK and integrin αv expression as well as M-CSF–induced migration of BMMs. Thus, we have shown in the present study that under direct stimulation FOXO1 promotes M-CSF/RANKL–induced osteoclastogenesis, whereas the net long-term indirect effect of FOXO1, -3, and -4, as shown by Bartell et al. is to reduce osteoclastogenesis associated with aging by attenuating oxidative stress. We thank Dr. Ronald DePinho for providing the FOXO1L/L mice. We thank Sri Aravind Thatikonda for assistance with genotyping and Sunitha Batchu for help in preparing this manuscript. This work was supported by National Institutes of Health Grant AR-060055. 2011. Regulators of osteoclast differentiation and cell-cell fusion. Keio J. Med. 60: 101–105.
. 2012. Osteoclast fusion and regulation by RANKL-dependent and independent factors. World J. Orthod. 3: 212–222.
. 2012. Osteoblastogenesis regulation signals in bone remodeling. Osteoporos. Int. 23: 1653–1663. 2011. Effects of inflammatory and anti-inflammatory cytokines on the bone. Eur. J. Clin. Invest. 41: 1361–1366.
. 2012. New insights into osteoclastogenic signaling mechanisms. Trends Endocrinol. Metab. 23: 582–590. 2013. Advances in the regulation of osteoclasts and osteoclast functions. J. Dent. Res. 92: 860–867.
. 2008. NFATc1 induces osteoclast fusion via up-regulation of Atp6v0d2 and the dendritic cell-specific transmembrane protein (DC-STAMP). Mol. Endocrinol. 22: 176–185.
. 2002. Induction and activation of the transcription factor NFATc1 (NFAT2) integrate RANKL signaling in terminal differentiation of osteoclasts. Dev. Cell 3: 889–901.
. 2013. Tmem64 modulates calcium signaling during RANKL-mediated osteoclast differentiation. Cell Metab. 17: 249–260. 2011. The osteoclast and its unique cytoskeleton. Ann. N. Y. Acad. Sci. 1240: 14–17.
. 1998. Impaired osteoclastic bone resorption leads to osteopetrosis in cathepsin-K-deficient mice. Proc. Natl. Acad. Sci. USA 95: 13453–13458.
. 1985. 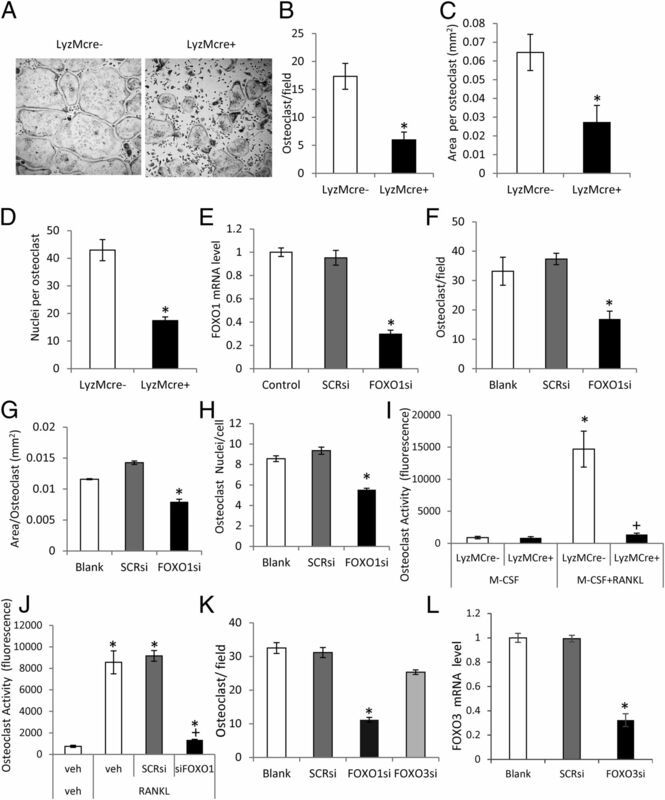 Cell-mediated extracellular acidification and bone resorption: evidence for a low pH in resorbing lacunae and localization of a 100-kD lysosomal membrane protein at the osteoclast ruffled border. J. Cell Biol. 101: 2210–2222.
. 2010. FoxO1 is a positive regulator of bone formation by favoring protein synthesis and resistance to oxidative stress in osteoblasts. Cell Metab. 11: 147–160.
. 2010. FoxO-mediated defense against oxidative stress in osteoblasts is indispensable for skeletal homeostasis in mice. Cell Metab. 11: 136–146.
. 2012. Role of forkhead transcription factors in diabetes-induced oxidative stress. Exp. Diabetes Res. 2012: 939751.
. 2011. The extending network of FOXO transcriptional target genes. Antioxid. Redox Signal. 14: 579–592.
. 2011. Mammalian target of rapamycin complex 2 (mTORC2) negatively regulates Toll-like receptor 4-mediated inflammatory response via FoxO1. J. Biol. Chem. 286: 44295–44305.
. 2009. High levels of tumor necrosis factor-α contribute to accelerated loss of cartilage in diabetic fracture healing. Am. J. Pathol. 175: 1574–1585.
. 2008. Activation of the acquired immune response reduces coupled bone formation in response to a periodontal pathogen. J. Immunol. 181: 8711–8718.
. 2010. FoxO1 regulates Tlr4 inflammatory pathway signalling in macrophages. EMBO J. 29: 4223–4236.
. 2014. FoxO proteins restrain osteoclastogenesis and bone resorption by attenuating H2O2 accumulation. Nat. Commun. 5: 3773.
. 2007. FoxOs are lineage-restricted redundant tumor suppressors and regulate endothelial cell homeostasis. Cell 128: 309–323.
. 2008. NOTCH1 regulates osteoclastogenesis directly in osteoclast precursors and indirectly via osteoblast lineage cells. J. Biol. Chem. 283: 6509–6518.
. 2009. GM-CSF regulates fusion of mononuclear osteoclasts into bone-resorbing osteoclasts by activating the Ras/ERK pathway. J. Immunol. 183: 3390–3399.
. 2007. Hyaluronan inhibits osteoclast differentiation via Toll-like receptor 4. J. Cell Sci. 120: 166–176.
. 2006. Purification of splenic dendritic cells induces maturation and capacity to stimulate Th1 response in vivo. Int. Immunol. 18: 445–452.
. 2011. FOXO1 modulates osteoblast differentiation. Bone 48: 1043–1051.
. 2013. HDAC7 inhibits osteoclastogenesis by reversing RANKL-triggered β-catenin switch. Mol. Endocrinol. 27: 325–335.
. 2012. Characteristics of a phage effective for colibacillosis control in poultry. J. Sci. Food Agric. 92: 2657–2663.
. 1996. Direct observation and quantification of macrophage chemoattraction to the growth factor CSF-1. J. Cell Sci. 109: 793–803.
. 2007. Ulcerative colitis and autoimmunity induced by loss of myeloid αv integrins. Proc. Natl. Acad. Sci. USA 104: 15823–15828.
. 2010. IGF-1 increases macrophage motility via PKC/p38-dependent αvβ3-integrin inside-out signaling. Biochem. Biophys. Res. Commun. 394: 786–791.
. 2009. 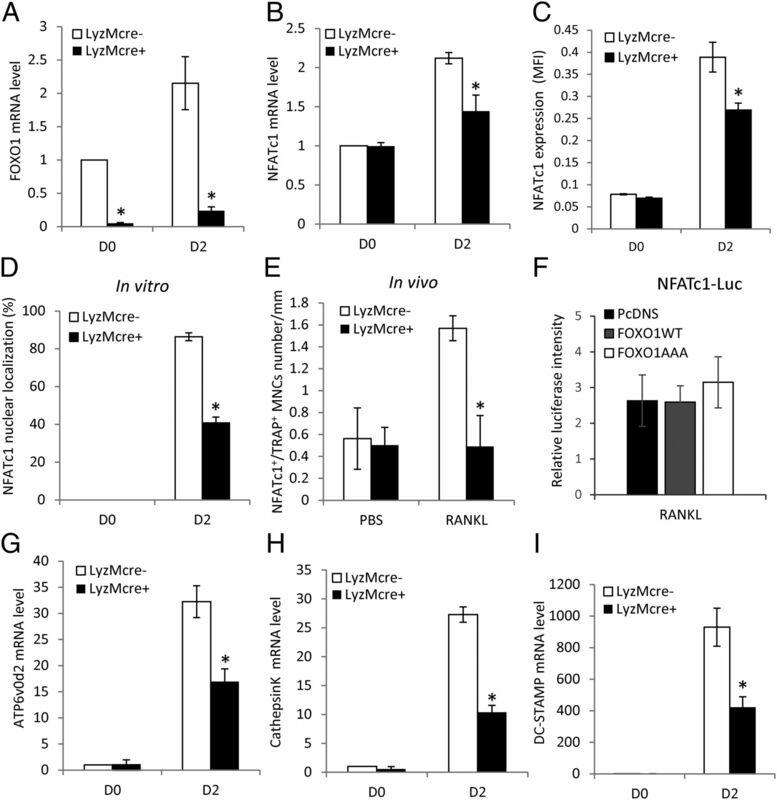 A transgenic mouse model of inducible macrophage depletion: effects of diphtheria toxin-driven lysozyme M-specific cell lineage ablation on wound inflammatory, angiogenic, and contractive processes. Am. J. Pathol. 175: 132–147.
. 2007. FoxOs are critical mediators of hematopoietic stem cell resistance to physiologic oxidative stress. Cell 128: 325–339.
. 2003. Osteoclast differentiation and activation. Nature 423: 337–342.
. 2009. NADPH oxidase-derived reactive oxygen species are essential for differentiation of a mouse macrophage cell line (RAW264.7) into osteoclasts. J. Med. Invest. 56: 33–41.
. 2008. The JNK-dependent CaMK pathway restrains the reversion of committed cells during osteoclast differentiation. J. Cell Sci. 121: 2555–2564.
. 2006. Induction of c-Fos and NFATc1 during RANKL-stimulated osteoclast differentiation is mediated by the p38 signaling pathway. Biochem. Biophys. Res. Commun. 351: 99–105.
. 2010. NFATc1: functions in osteoclasts. Int. J. Biochem. Cell Biol. 42: 576–579.